I’ve been itching to get a boat again after watching the local tweeps from the sidelines talk about all the water they’ve been accessing lately. Being a wader only in Texas really limits the spots you can fish. Having a 4 door sedan and a Mini Cooper doesn’t make it easy to get the more popular kayak/SUP to the good put in spots either though. What to do? Go with a kayak and deal with the storage issues and transport hurdles? Buy a standard pontoon boat? Or try to find something else out there via Google? I went the later route. 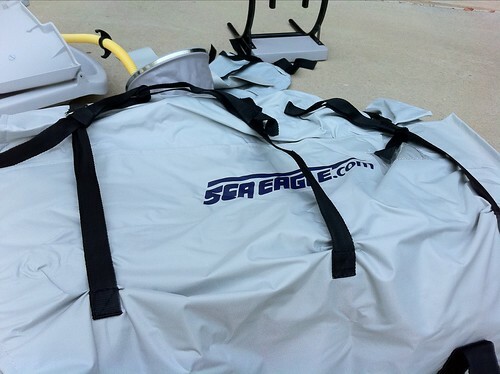 I came across some inflatable boats from Sea Eagle that looked interesting. They were made for fishing and easy setup and storage. And the best part was they were pretty inexpensive. I wanted to get a 2 person boat so my son and I could fish together but decided that the cost, storage, and transport of a larger boat wasn’t ideal as I would be fishing solitary 80% of the time. I settled on the 285 fpb version. Like I usually do when having to get a purchase by Mrs. Angler Wannabe, I searched for the best possible price. I was happy to find that there were some good discounts available on the web. 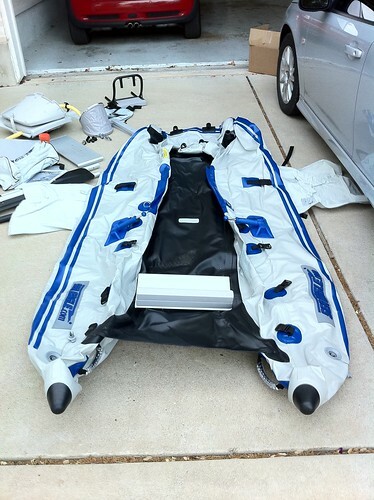 The best price I could find was from a company called Inflatable Boats 4 Less. Their price was a good $200 less than everyone else and they didn’t charge for shipping. I placed the order and immediately received a confirmation and personal email from the company’s owner with a status and update on expected shipping dates and info on the boat registration. I liked the personal touch and expedient response. A good start so far. A couple of business days later, I got a followup email from IB4L with the Fedex shipping information. The boat was going to be here in a couple of days. That was fast!! On the day of arrival, I got a Fedex notification that the boat had been delivered at 10:42a to my house. Surprised that Mrs. Anglerwannabe hadn’t IMd me to tell me, I checked in with her to see if all the 5 packages had arrived. She hadn’t seen Fedex. Strange. So I waited an our or so. No boxes. I called Fedex and they said that they would call the driver to check on it. Around 3:30p, no call and no boxes. I called Fedex back and they said that they would like have the driver call in the next morning. Uggh. There goes my plan to rush home and find the nearest water to try it out. On the way home, I decided to drive around the subdivision to see if the driver delivered it to the wrong house. I started on the next block over from my house. There was a house number that was the same as mine and alas, boxes sitting on the porch. The house is for sale and nobody was living in the house so that explains why the neighbor didn’t alert us. I quickly loaded the boxes into my car and took them to their proper home. Of course I couldnt wait to unbox my new toy so I drug the boxes out on to my driveway. I took some pictures to show the progress of the assembly. I don’t have many pics because there just weren’t many steps. Setup was very easy. The instructions were written by a native English speaker which was nice. Most of the ones I’ve suffered through recently made a fairly easy process hard so nice to actually have well crafted steps that make an easy process easy. The boat appears to be very well made and extremely well designed. 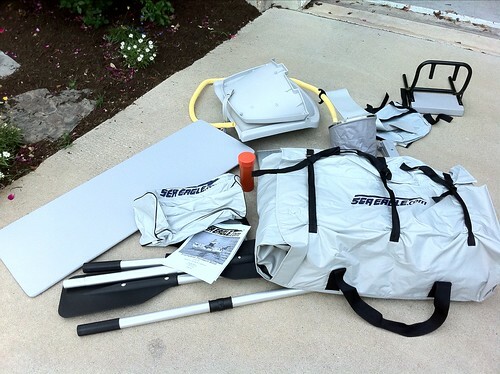 You can very much tell that this design has evolved over years of optimizing boats for ease of setup, stability for the angler, minimal transportation needs and easy take-down and durability. I’m very impressed so far. I’ll be sending out updates about how well it performs on the water, hopefully in the near future. All signs point to a great purchase. 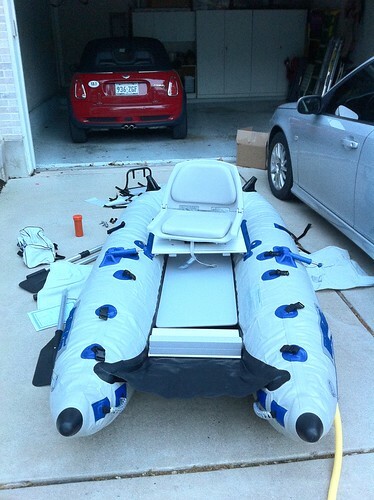 One thing that I really want to point out is the great service and experience I had with Inflatableboats4less.com. The site was easy to navigate and informative. The order process was completely non-eventful which is the way you want it. The owners, Tim and Crystal Ryerson were so nice and helpful. Crystal even sent me an email making sure that I wasn’t worrying about the lost boat as she assured me that it will get straightened out. See if you get that level of service at Cabellas. I don’t think so. If you are looking for a boat, check them out at their site or Like them on Facebook. Now I have more water to fish. Therefore, hopefully more fishing reports coming soon.